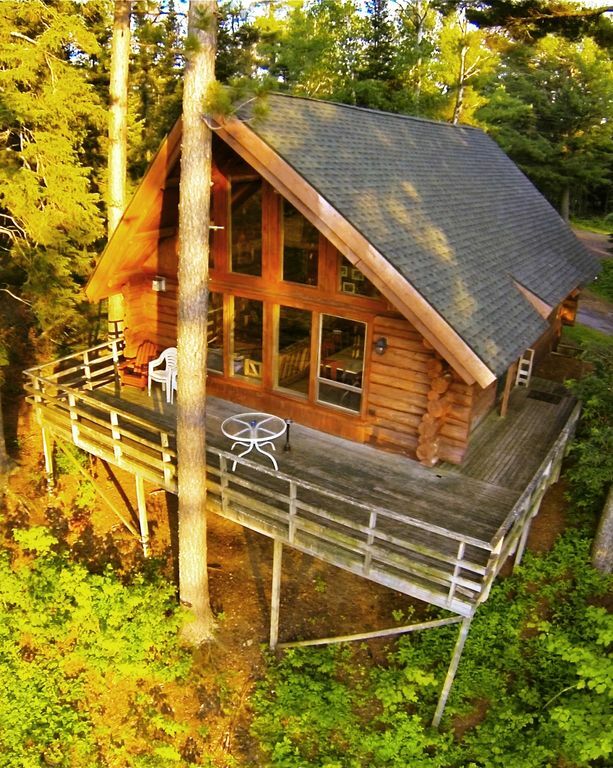 The Big Pines Getaway is located on a small quiet lake in the wild heart of the Superior National Forest, only about 8 miles from the southern boundary of the B.W.C.A. A perfect place to commune with nature, reconnect with family and restore your spirit. The living area has a panoramic view of Lake Gegoka and the lake shore is just a short walk down the hill. If you are planning a wild party weekend, please seek different accommodations. Big red and white pines tower overhead, providing nesting habitat for eagles, osprey, owls and kestrels. This hand scribed full log house has a genuine 'Northwoods' feel. A fully vaulted main room overlooks Lake Gegoka, bringing the outdoors right in through a full wall of glass. The loft offers a special place for kids or adults to have their own space up in the treetops. Spectacular sunsets can be enjoyed from the living room, the deck or better yet a canoe. The Log Home is simply and comfortably furnished, with a modern kitchen and 2 bathrooms. A gas fireplace completes the rustic, relaxed atmosphere. We even throw in 2 CANOES and FIREWOOD. Silent recreation for all seasons at our gem in the forest. Lake Superior's North Shore is only about 30 minutes away and provides many opportunities for day trips, including Split Rock Lighthouse tours, the Superior Hiking Trail and some of Minnesota's most popular State Parks. It's a great place to cool down on a warm day inland and grab a bite to eat or a special souvenir. Ely is a 45 minute drive and has a variety of good restaurants and unique gift shops. This lively little town is the jumping off point for Boundary Waters Canoe Area trips and has some great attractions for rainy or sunny days. Both the International Wolf Center and the North American Bear Center are great places to learn about 2 of the areas wild residents. The Soudan Mine tour is a fascinating look back in time to 'hard rock' underground mining on the Range in the early 1900's. Sandy bottom Lake Gegoka. Use of 2 canoes. Shared use of small paddle boat and row boat. Good fishing/swimming from the dock or boat. Lake frontage is just a very short walk down the hill. Log home windows and deck have an expansive view of Lake Gegoka. Good fishing and swimming from the dock or a boat. Lake frontage is just a very short walk down the hill. In floor heat for toasty feet! Cozy gas fireplace in living room. Exclusive use of 2 canoes. Small paddle boat and rowboat available on first come first served basis (may need to share with 1 other cabin rented at this location). Paddles and life vests available. Direct access to 30km Flathorn/Gegoka classic ski trails. No equipment rental. Had a fun time enjoying the surrounding nature with the family and it certainly was close enough to make a day trip down to Lake Superior! Thanks for everything! Our hunting group has stayed at National Forest Lodge in October for over 20 years. That speaks for itself about the great accommodations and owner/host Andy. They just simply can not be beat. Andy has been so helpful, kind, and gracious that we almost feel like family. Not sure Andy would want to adopt this group though. Looking forward already to our next hunting trip in October 2019. Thanks Andy for everything you do for your guests. Been staying with Andy and Laura at the NFL for years and hopefully for years to come. Thanks for another year of memories in the north woods. Quiet getaway. Good scenic views. The cabin definitely met our expectations. We've stayed at similar cabins across MN, and this one really was worth the price. It's a 3 story cabin, that has plenty of space for 10 people. We enjoyed the quiet relaxing atmosphere. During our stay, we saw plenty of birds, we didn't see Moose, but did hear wolves howl at night. The first thing you will notice when walking in, is the view of the lake from the large windows. It is a bit higher than the pictures, (we thought the lake would be relatively closer). When you do walk to the dock, there was a nice view, and we enjoyed the canoes. My advice is to bring plenty of bug spray, as there were decent amount of mosquitoes this time of year. The cabin does not have AC, so luckily it was just cool enough for us during the day and night, we had kids. Overall the experience for my family was great, but outside of the cabin, trails, fishing, canoeing, there really isn't anything nearby for you to do other than explore the outdoors. We enjoyed our time here and would possibly visit again in the future. Thanks! There were several fire pits, grills and picnic benches. 1. the lodge was not as big as the pictures suggested. 2. It is a good four hour drive from Twin Cities. Try to get in before dusk. The lodge is well cared for.There was a good stock of board games.The kitchen utensils were more than sufficient. The owners were pleasant and welcoming. If a quiet getaway is what you want, this is it! Beautiful northwoods location on a rustic lake. The cabin was as advertised with thorough listings of what to bring (I would add plastic wrap or foil and tupperware for leftovers). Very clean and well-maintained house with spaces to gather. We had 7 adults and 2 one-year olds and had fun hanging out together (bring baby gates). Walked the forest service trail around Flat Horn lake, very beautiful. For families - know there isn't a beach and the water is full of tannins, but some of us had fun swimming. The mosquitoes this time of year are awful but not anyone's fault, just part of the overall experience! Ski: We offer direct access to and maintain 30K of groomed/tracked classic cross country ski trials. Flathorn/Gegoka trail system. No skijoring. Also designated snowshoe trails.